Whittier 17, La Habra 1 — The team of Murisa Brumfield and Raquel Castillo swept in doubles for the Cardinals (2-0) in a nonleague match. Buena Park 10, Whittier Christian 8 — The teams of Juliette Moreno and Nikki Alvarez, Sam Martinez and Jessica Maher and Laney Gradilla and Chloe Subia each won two for the Heralds (0-1) in a nonleague loss. California 3, Norwalk 1 — Summer Gonzales had 11 kills and four digs, Allianna Loera had eight kills, 29 assists and seven digs for the Condors (1-1) in a 25-20, 21-25, 26-24, 25-23 nonleague win. Arianna Gomez had six kills and Leanne Ruiz had 13 digs for California. St. Paul 3, La Mirada 0 — Hannah Tostado had 12 kills to lead the Swordsmen (7-0) to the nonleague victory. Flintridge Sacred Heart 3, Rancho Cucamonga 2 — Kayla Lund had 24 kills, 19 assists and 11 digs and Ellis DeJardin had 21 kills, 33 assists and 12 digs and Maddie Pernecky had 26 digs for the Tologs (2-0) in a 20-25, 18-25, 25-16, 26-24, 15-13 nonleague win. COSTA MESA — It’s hard to imagine a win in a season opener matching what La Mirada High accomplished last season by winning CIF Southern Section and CIF State Bowl championships.But Friday might be the exception.The Matadores, outscored 118-15 in two games against Trinity League foes last year, enjoyed that championship feeling after scoring a 21-14 victory over Orange Lutheran at Orange Coast College.The host Lancers began the season ranked No. 14 in the state by MaxPreps.com.Nick Hernandez led the Matadores with 177 yards and scored the game-winner on a 4-yard run with 6:54 left in the fourth quarter. Orange Lutheran led 14-7 at halftime, but La Mirada got back in it when RJ Lan pressured Orange Lutheran quarterback Ryan Hilinski, resuting in a Chad Wilson’ 56-yard interception return for a touchdown to tie the score 14-14 with 5:37 left in the third quarter. La Mirada then went 74 yards in the fourth quarter to win it. The 15-play drive was helped by a 17-yard run by RJ Lan on a fake punt. Hernandez and Gabe Barba, who had a 17-yard run inside the Lancers’ 17, did the rest, with Hernandez running it in from the 4 for the lead. 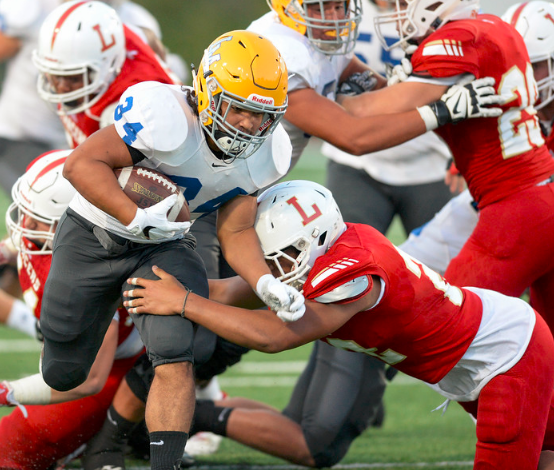 La Mirada then stopped two drives by Orange Lutheran before running out the clock. Stan Berryhill led Orange Lutheran with five receptions for 120 yards and two scores. The second came on a 71-yard catch and run from Hilinski to give the Lancers the halftime edge at 14-7. Earlier, La Mirada had tied it at 7 after Elijah Hicks returned a punt 50 yards to set up a 35-yard pass from Tristan Meyer to Jeremey Clark with 3:28 left in the half. MONTEBELLO — Schurr High’s football team, ranked seventh in the CIF Southern Section Division 12 preseason poll, took an early lead and held on for the 33-22 victory over visiting California Friday night in the opening game of the season for both teams.Leading the way for Schurr was junior quarterback Miguel Aguero with 234 yards passing and one touchdown. Aguero was 9 of 14. Schurr wide receiver Francisco Remigio had three receptions for 111 yards to lead all receivers. Noah Rangel led the Spartans on the ground with 98 yards on four carries and a 3-yard touchdown run. The junior also had two receptions for 44 yards. Cal was led by senior running back Andrew Reyes with a game-high 169 yards on 25 carries for two touchdowns. He also had two 2-point-conversion runs for the Condors. Cal junior running back Christopher Lowden ran for 75 yards on 10 carries and a rushing touchdown. Montebello High School needed only one big play to stifle any hopes that El Monte might put together a rally in the season opener for both teams on Friday night. The Lions scored with 39 seconds left in the half, Andrew Ramos completing an 8-yard pass to Sal Chavez, to cut the Oilers’ early lead to 13 points. The Oilers scored 19 seconds later and had the game’s final 19 points in a 40-6 nonleague victory. The Oilers returned the Lions’ kickoff after the TD 45 yards and Gabriel Tapia threw a 33-yard TD pass to Isaiah Garcia. Tapia completed 11 of 18 passes for 150 yards, both to Garcia. He had five catches for 91 yards 2 TDs. Kristopher Rodriguez rushed for 91 and a TD and recovered a fumble in the end zone. Ramon Preciado returned an intercepetion 75 yards for a score. Despite a slow start, Whittier took advantage of four turnovers and used two 1-yard touchdown runs from Alex Retana to blank the Raiders at California High. Retana got Whittier on the board with 54 seconds remaining in the third quarter on a fourth-and-goal play from the 1-yard line. Less than four minutes later, Whittier took over deep in Sonora territory, thanks to a bad punt snap and Retana scored again from 1 yard out. Jorge Vazquez capped the Whittier scoring with a 27-yard field goal. Alan Soto, Raymond Yrigoyen, Aaron McClain and Juan Santos all picked off Sonora quarterback Trent Rodriguez. Dylan Salcido completed 12 of 22 passes for the Cardinals and rushed for a game-high 76 yards on 11 carries. Salcido recovered a Rodriguez fumble and brought it back for what would have been an 80-yard touchdown, but a penalty nullified the score. Retana finished with 25 yards on five carries, including the two scores and caught one pass for 16 yards. Vazquez was hurt after making the field goal and did not come out for the extra-point attempt after Retana’s second score of the night. Rodriguez completed just 7 of 22 passes for 45 yards, was picked off four times and lost a fumble. Ethan Cook led Sonora (0-1) with 73 yards on 12 carries. Quinn Commans and Cade McGee put on quite a show in the Heralds’ season opener at Whittier College. Commans threw four touchdown passes to McGee, 40, 85, 56 and 13 yards, the last two to help the Heralds take a 12-point lead in the fourth quarter. Justin Osborn gave Whittier Christian a 26-22 lead with 15 seconds left in the third quarter. Commans’ 56-yarder to McGee made it 33-22, Bishop scored to make it 33-29 and McGee caught a 13-yard score two minutes after his 56-yarder to get the lead to 12. Commans also threw a fifth TD pass and rushed for a score. The Phantoms jumped to a 27-0 lead and cruised to the nonleague victory at Pioneer High. Chris Ramsey threw a pair of touchdown passes for the Chiefs. The host Mavericks rallied for 16 points in the fourth quarter to rally from a 21-14 deficit. Alfonso Ibanez scored on a 98-yard run and Justin Moreno threw a TD pass. Eli Anderson rushed for 124 yards and four touchdowns and Zach Fogel threw for 181 yards as the Highlanders won a shootout. 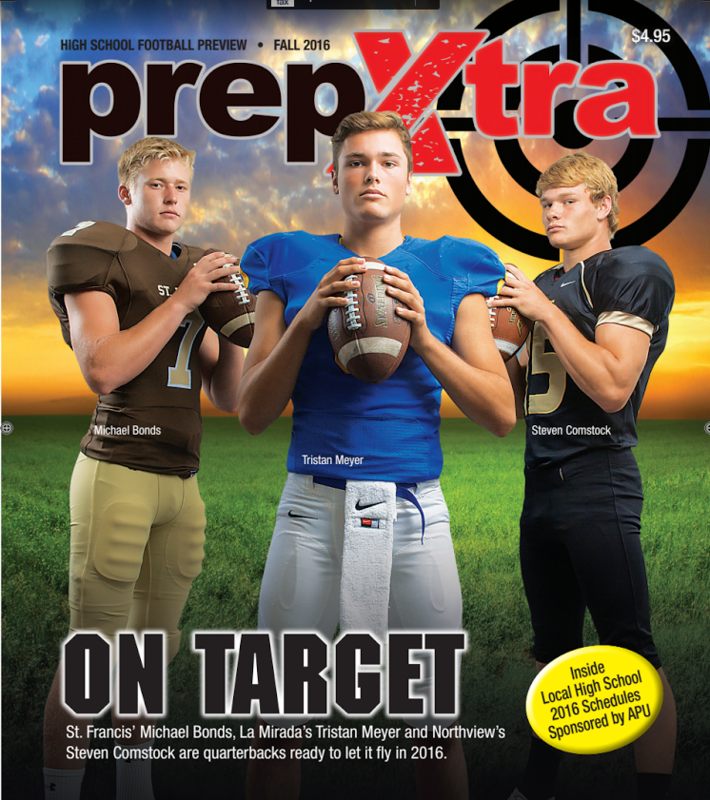 Click to read online: The 2016 Prep Xtra Football Preview magazine will be distributed on Wednesday, Aug. 24, in home subscription delivery for the Pasadena Star-News, Whittier Daily News and San Gabriel Valley Tribune. Copies can also be purchased at newsracks throughout the San Gabriel Valley and Whittier areas, and can be purchased in person at 605 E. Huntington Drive, Monrovia, Suite 100, 91016. Cover Story: Armed and ready, Northview quarterback Steven Comstock, St. Francis’ Michael Bonds and La Mirada’s Tristan Meyer are ready to show their stuff. Aram Tolegian’s preview column: The War on Football … Despite the risks, the game teaches virtues on a big stage. Best games to watch: A week-by-week look at the best games to watch in the San Gabriel Valley. Schedules: Team schedules with address and starting times. Preseason All-Area: San Gabriel Valley Tribune offense and defense. Preseason All-Area: Pasadena Star-News offense and defense. Preseason All-Area: Whittier Daily News offense and defense.